Advanced Organics uses only 100% recycled wood waste and other natural waste materials for our products. We do not manufacture, sell, or promote materials from endangered species and/or clear designated species of trees for turning a profit. It is our intent to reduce waste, and in the process beautify your property. Unfortunately, large mulch manufacturers throughout the county are suppling chain stores and local nurseries with bagged and bulk mulch produced from such materials. We urge you to take part using 100% recycled products in your landscaping. We supply and manufacturer a variety of decorative stone, gravels, and sand. Bulk gravels include 3/4 Trap Rock, 3/4 Native Stone, 3/8 Native Pea Gravel, 3/4 White Decorative,3/8 Blue Chip,Stone Dust, Screened Sand and Septic Sand. Now offering bulk Winter Road Salt and Salt/Sand mix. Open 24 Hours during storms! Mulching is one of the most important ways to maintain healthy landscape plants. 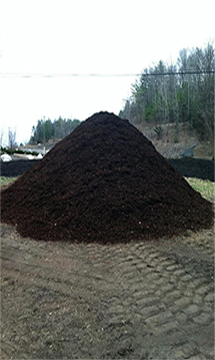 A mulch is any material applied to the soil surface for protection or improvement of the area covered. Mulching is really nature’s idea. Mulches reduce the growth of weeds, when the mulch material itself is weed-free and applied deeply enough to prevent weed germination or to smother existing weeds. Mulches prevent soil splashing, which not only stops erosion but keeps soil-borne diseases from splashing up onto the plants. Organic mulches can improve the soil structure. As the mulch decays, the material becomes topsoil. Decaying mulch also adds nutrients to the soil. Mulches prevent the trunks of trees and shrubs from damage by lawn equipment.